OF PARKING IN ANY WATER CONDITION. A road about 800 feet long runs down to the dock and two parking lots from the resort. The dock is a newer model metal structure with wood decking. Each stall has a 110vac electrical receptacle for battery charging. The dock interior, as well as the external walkway and parking lots, are well lit. The 12' x 24' swim deck is also well lit. We have a complete 8' stainless steel fish cleaning station with running water on our dock and freezer facilities at the resort for preserving your catch. Your first boat stall is free with a cabin rental. It does not matter which boat stall you receive, All stalls are wide enough for any size trailerable boat. Lake water levels don't affect access to our dock. Whether low, high, or at normal levels you can always drive to our dock, park, and walk right onto our dock. We have two private parking lots. You can park in either lot when lake levels are normal, or low. The second parking area is for high water levels. No matter how high, or how low the water gets, we have parking. During normal and high water you can launch right off our dock road. During low water levels you can launch at the public hard-surfaced launch just a few minutes away. Once you have your boat in our dock you can park your trailer at the resort in our large trailer parking lot. Our dock and parking lots are well lit. The dock is lit from end to end for safe and fun night time use. Many of our guests enjoy fishing and swimming at night. 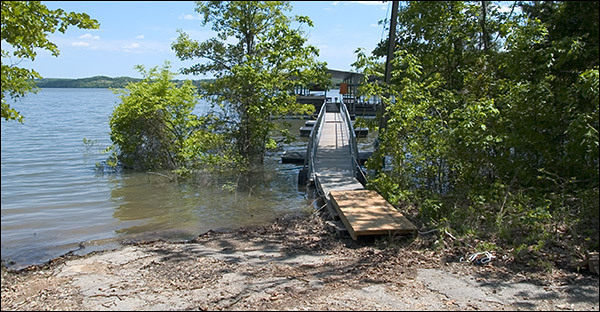 Even when run all the way out in high water, our dock walkways do not rock from side to side when you walk them. They are solid! Side rails run the entire length of all walkways. Many guests fish for crappie, bass, catfish, and walleye, day and night, around the boat stalls or at the end of the dock. We have a large stainless steel fish cleaning sink at one end of the dock. Clean your fish and throw the remains in the lake where catfish and other fish, and turtles, patiently wait. Your dog is welcome on our dock as long as you are with your dog at all times. All dogs must be friendly with people and other dogs. It's about 800 feet from the resort down the road to our dock. This is a private road that makes a great place to walk your dog. Lined with hardwood forest you'll enjoy bird songs, wildflowers, and small wildlife on our dock road. 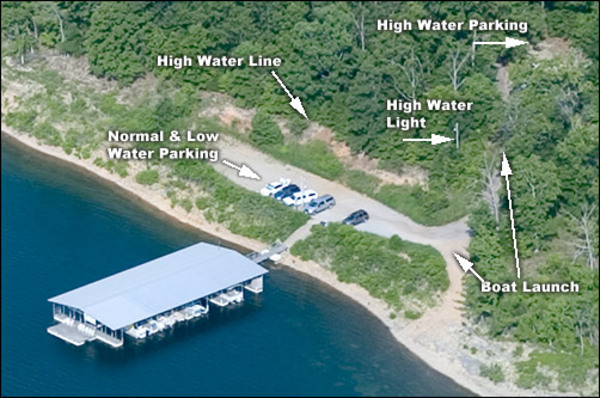 On Norfork Lake only floating docks are allowed under Corps Dock Permits. Steel cables run out from all four dock corners. Two run into the water, two run onto shore. The cables running out into the water anchor to large cement weights. The cables running to shore connect to steel pins in the ground. As the water rises the two outer cables are loosened, and the two inner cables are tightened thereby pulling the dock toward shore. As the water level drops the opposite process is used to move the dock back out away from shore. When the dock moves in or out boats in the stalls are not harmed as the movement is very slow.